Gain holistic visibility across your enterprise collaboration environment. Proactively prevent disruptions, quality issues before users are impacted. Grow adoption of new collaboration technology and workplace initiatives. Better manage UC and real estate costs, and increase organizational agility. Stop flying blind. Solve problems. Save money. Vyopta enables IT teams to assure high quality collaboration no matter how large or complex the video and voice UC environment. Use performance metrics, root-cause analysis, and historical analytics to fix issues fast, accelerate adoption, and reduce costs. Vyopta allows UC and workplace experience teams to optimize meeting room and huddle space usage, improve booking behavior, reduce real estate costs and increase ROI on collaboration technology. 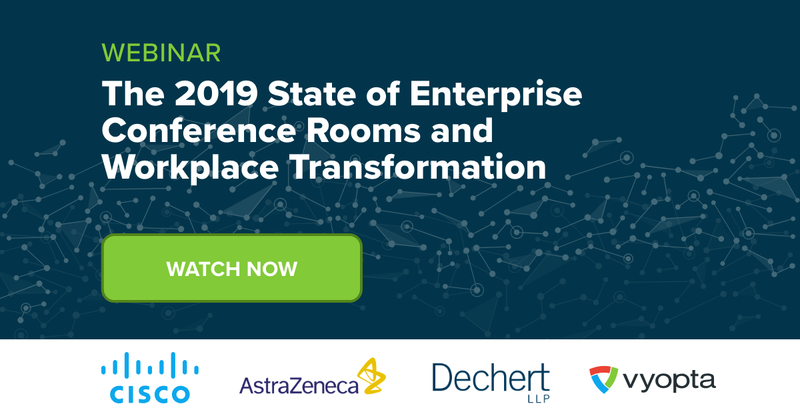 Understand how rooms are used around the clock, what activities took place in and outside of calls, and which users are responsible for missed and inefficient meetings. Take action to improve collaboration. Start your online demo today!